The imperial soup is a classic Bolognese soup made with cubes of baked semolina and Parmesan, then served in a rich broth. Zuppa imperiale means “Emperor’s soup” and is similar to Krinofel – an Austrian soup prepared with similar ingredients. 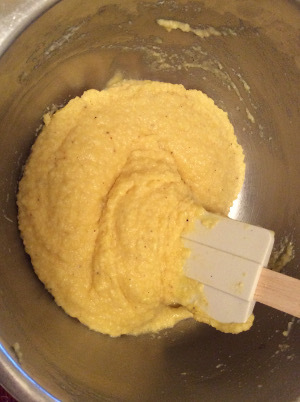 The legend says it was Marie Louise, Duchess of Parma and the first wife of the Emperor Napoleon I, who imported the recipe to Emilia-Romagna. 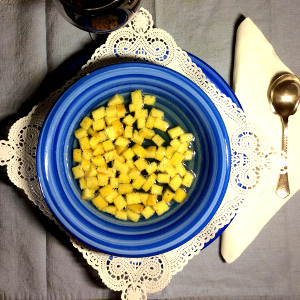 In fact, the name of Zuppa imperiale reminds a noble and upper-class soup. Since its ingredients (like butter or Parmigiano) were very expensive in the past, this is most likely the cause of its name. Pellegrino Artusi, the businessman and writer best known as the author of the famous cookbook “Science in the Kitchen and the Art of Eating Well”, talks about Zuppa Imperiale. 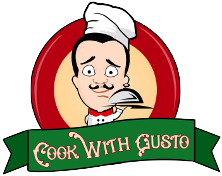 The recipe is mentioned in chapter 15 of the book and is called “Minestra composta con il semolino”. 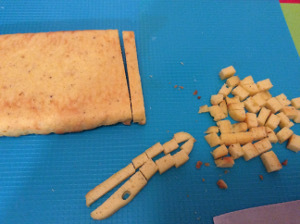 This recipe is a good option for children and it is fast and easy to prepare. It is great if you have some ready to use broth, or in case you want to prepare some, you will find the recipe below. Grated Parmigiano Reggiano cheese 60 gm. 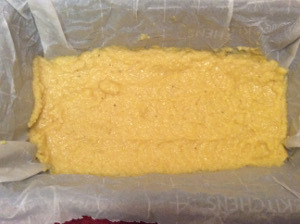 1 large bowl, 1 whisk, 1 tart pan, 1 cheese grater, parchment paper. Melt the butter in a small pan over a very low heat, or in a microwave. When the butter is melted, set aside to cool down. 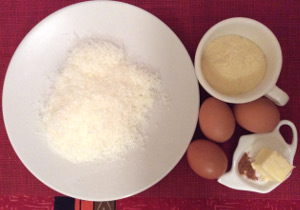 Meanwhile, crack the eggs into a bowl, mix well and add the Parmigiano cheese. 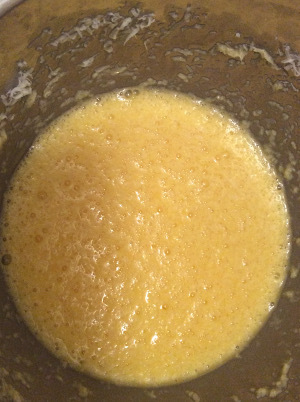 Mix well again, then add semolina, add the melted butter, and whisk until everything is soft and fluffy. At this point add salt, pepper, and nutmeg. Mix well and pour the mixture into the roasting pan you had previously lined. 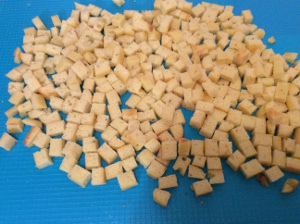 As soon as it is golden brown, remove from oven and cut into small cubes. Bring the broth to a boil, add the diced Imperial Soup and serve hot immediately (you can add some extra Parmigiano if you like). Make a great meat stock is very easy, it just needs very gentle cooking for several hours. 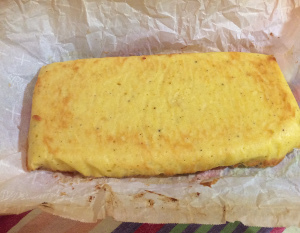 There are many versions, even made without meat. This is our family recipe. Wash the vegetables and meats. Peel and roughly chop vegetables. Place everything in a large pot, fill about 3/4 full of cold water (it must be cold to extract all the flavour from the ingredients), add salt, place over medium-high heat, and bring to a boil. Lower the heat and skim off the scum that rises to the top. Cook for about 2 hours, skimming again if needed. When the stock is ready, switch off the heat and pass it through a fine sieve (reserve meat). Let the broth cool or use it immediately. 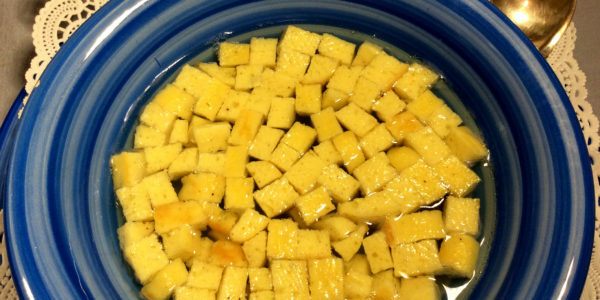 If you want a clear broth, allow cooling then transfer to a container and place in the fridge for a few hours. You can also freeze the stock. Traditionally, the reserved meat is used to prepare delicious meatballs, meat salads or served with a simple seasoning of olive oil, salt and black pepper.